True wine connoisseurs are taught to distinguish varietals, identify flawed bottles, and cry pure chardonnay. Become one with the grape with this Groupon. Tastings are held most Saturdays at 11:30 a.m. and/or 2:15 p.m. Occasional Thursday evening tastings available at 6:15 p.m. Premium wine tastings at the Domaine Tasting Room in South Salem, NY begin with special selected champagne as well as domestic and imported red and white wines from various wine regions, and then conclude with a sauterne-like dessert wine. Guests sample a total of 10 fine wines including Bordeaux reds, Burgundies, Brunellos, Super Tuscans, Cabs, Loire whites, and more. 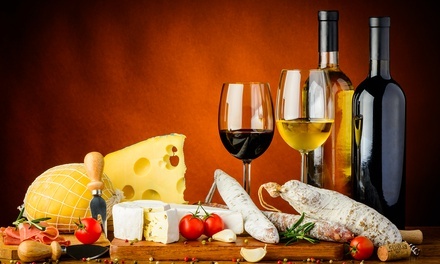 All wines perfectly paired with a hand-crafted selection of artisanal cheeses, presented by Certified Cheese Professionals from Fairfield, CT & Greenwich Cheese Company. Wine experts Jim Winston or Jay Boland lead discussions and answer questions as they personally guide tasters through the unique aromas and flavors of each domestic and imported wine. After the tasting, each guest takes home a Riedel crystal wine glass, and wine lovers can apply their tasting knowledge to purchase their favorite wines for the cellar. In addition to special discounts available only at these tastings, participants will receive an extra $20 off any 12-bottle mixed case ordered. Reservations are required, and early reservations are strongly suggested as seating is limited. Limit 1 per person. Limit 1 per visit. Valid only for option purchased. Not valid for the purchase of alcohol. Tastings subject to availability. Reservation required. Early reservations strongly suggested, seating is limited. 48 hour cancellation/rescheduling notice or a $10 fee will apply. GrapesWine.com reserves the right to reschedule tastings. In-store only. Not valid for sale items. Alcohol is not discounted more than 50%. Merchant is solely responsible for all sales and delivery of alcohol. Must provide 21+ ID to receive alcoholic beverages.